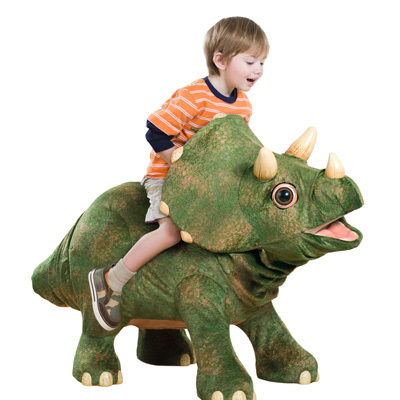 Fruitless Pursuits: Most Memorable Presents: KOTA THE DINOSAUR! I did not receive this most memorable gift. It's one that I gave it to my daughter for her second Christmas. I mean... Santa gave it to her. It's Kota the Dinosaur! He moves around and makes noises, and is just plain awesome. I had my eye on him all season. And while normally $150-$200, I scored him for just $50 at Target right before Christmas. Nowadays, Kota is hanging out in our basement. But everytime we go down there, my daughter still wants to ride on top of him and feed him leaves. I bet you wish you had a dinosaur in your basement.